For our version numbers, we follow the Semantic Versioning standard. Please Note: This document describes functionality only available if you have taken control over a Toolkit configuration. Please refer to the Shotgun Integrations User Guide for more details. This application provides an interactive python console for any environment that runs Toolkit applications. This is a python console panel for use in DCCs with access to a python interpreter that have limited or no support for interacting with said interpreter. Once installed, the console is registered as a panel in the DCC and is available in the Shotgun menu. 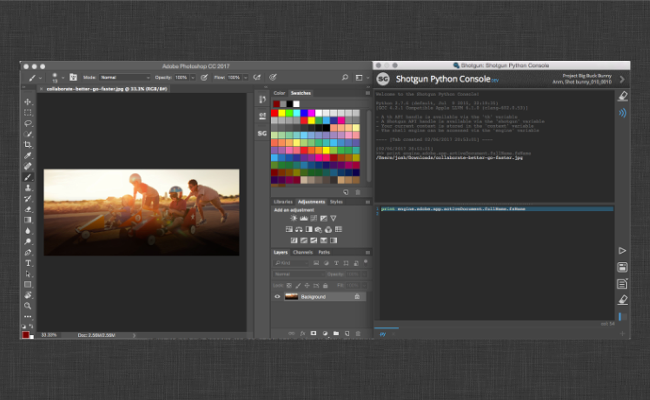 In apps that support embedded Toolkit panels (maya, nuke, houdini), the console will display in a docked panel. When using with older versions of these DCCs or in a DCC that does not support panels, the console will simply be shown as a regular Toolkit dialog. The python console displays one or more tabs, each containing an editor and an output window. New tabs can be created by clicking the + button in the bottom right hand corner. Tabs have an x button next to the tab name that allow you to delete the tab. Double clicking the tab itself will prompt you to enter a new name for the tab. Tabs can be rearranged via drag and drop. The state of the tabs is saved when the DCC is closed and restored on the next launch. 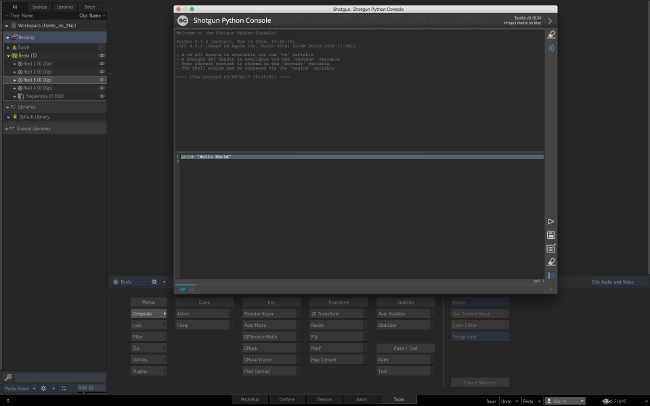 The console has an input area for editing python. The editor includes line numbers, highlights the cursor's current line, and does some basic syntax highlighting. The console attempts to use the palette of the DCC to give it an integrated look and feel. The output area displays the results of the executed python. Echoing the source python commands is turned on by default and is differentiated in the output by being prefixed with >>>. Each execution is also marked with a timestamp. There is a toggle for turning the echo off. Syntax and Runtime errors are shown in red with a full stack trace for debugging. Clear - Clear the contents of the output browser. Echo - Toggle echoing the executed commands in the output browser. Save - Save the current contents of the editor to a file. Open - Open a file in the editor. Clear - Clear the contents of the editor. Some Shotgun/Toolkit globals are pre-defined in the console, similar to what is available in the Shotgun Engine for the shell. The app comes with a hook that can be implemented to load python source from an external location. The hook is called external_sources_hook and requires implementing a method called get_external_source_actions. The method should return a list of QActions that, when triggered, add a new tab (with content) to the console. An example implementation is provided that loads gists from github for a list of predefined users. The actions returned by the hook are shown in the popup menu displayed when the Open button is pressed and held. NOTE: These hotkeys may not be available in all DCCs. In some older versions of DCCs, leaving the python console open when closing the session may cause a crash. We believe this may be a bug in some older versions of PySide. More recent versions of DCCs, bundled with newer versions of PySide, do not appear to crash on exit. If you encounter this issue with a recent DCC release, please submit a ticket so that we can investigate further. If you have access to the Shotgun Pipeline Toolkit, you also have access to the source code for all apps, engines and frameworks in Github where we store and manage them. Feel free to evolve these items; use them as a base for further independent development, make changes (and submit pull requests back to us!) or simply tinker with them to see how they have been built and how the toolkit works. 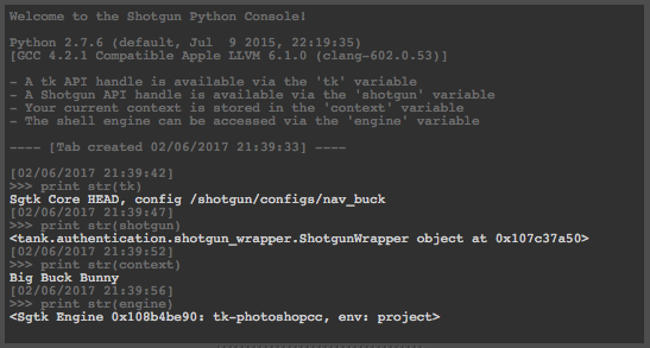 You can access this code repository at https://github.com/shotgunsoftware/tk-multi-pythonconsole. You need Shotgun version v6.2.0 or higher to use this. You need Shotgun Pipeline Toolkit Core API version v0.16.32 or higher to use this. Below is a summary of all the configuration settings used. These settings need to be defined in the environment file where you want to enable this App or Engine. Description: Supplies information about external sources for new tabs. Welcome to the release notes for this App. Below you will find an overview of all the changes we did for each release. We try to be as detailed as possible and include all bugs we have fixed, features we have added and things that may have changed. If you have questions about a particular release, don't hesitate to contact our support team! Moves the python console menu item from the main menu to the context menu. Removes problematic profiles from png files used as icons. This will silence libpng warnings from Qt when the png files are loaded as pixmaps. This is a second attempt as this profile stripping, and uses ImageMagick's "mogrify" command to achieve the desired result, which maintains color consistency. The console should work in any Toolkit engine. Currently, the Shotgun Engine for Photoshop only supports CS6 and CC ( here's the note in the engine docs). 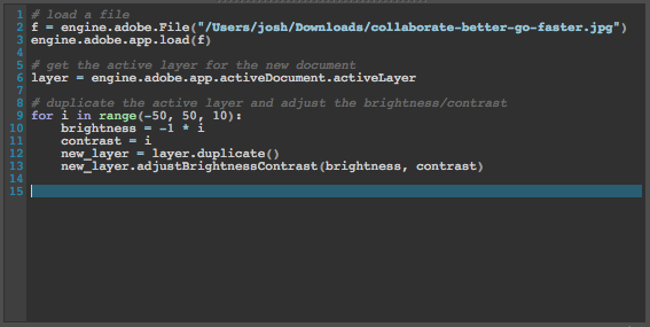 That said, a refresh of the Photoshop integration is slated for the coming months. is it possible to change the interface color? I'm not sure why but mine is practically unreadable, especially the current line you're typing on. I'm on linux, and have tried changing the system's window colours, but that had no effect on this console. What SG engine and DCC is this running in? Also, what version of the python console are you running? Currently there's no way to configure the colors unfortunately. It tries to be smart by using the palette of the DCC, but as you've found is not ideal. It works well enough in some but others its just bad (as you've found). Once I know the DCC and have some cycles, I can see about making it look better. I'll also put in an internal ticket to investigate making the colors configurable. If you have any questions about how any of that works let me know! Hi Josh, I'm running rv 7.1.1, shotgun v7.0.2.0 (build f9be2f2), and pythonconsole version 1.0.41. It's not too big a deal if there's no simple way to configure it, as I just write my code elsewhere and run it in the console, but I thought I'd report it so thanks for submitting the support ticket. 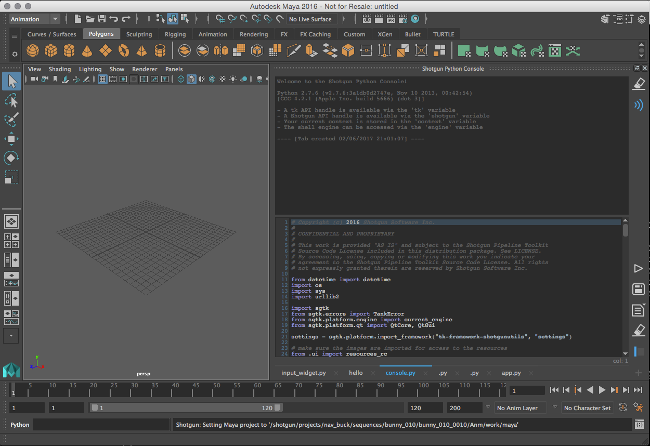 Just installed it to my dev configuration and to the Maya engine. Works well. This app is really gonna help while debugging and developing apps. Thank you! How can we upgrade Python version for the Shotgun Python Console? 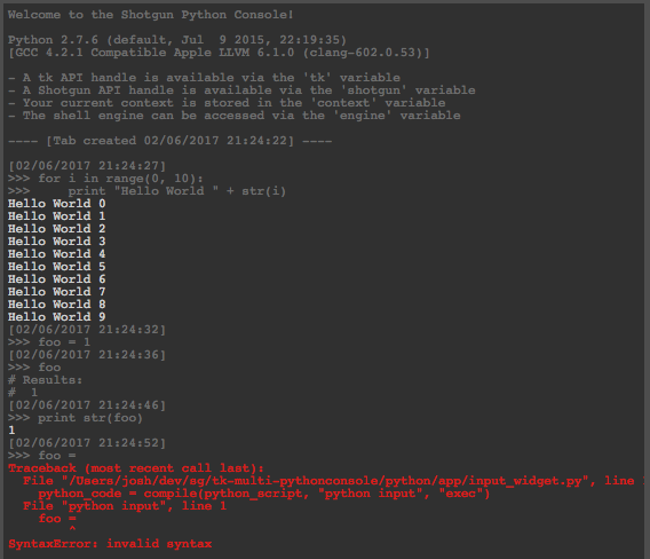 The Python version that we currently use on the Shotgun Python Console is 2.7.6. Our Toolkit Core version is v0.18.88 and our Shotgun Python API version is v3.0.32. We would like to upgrade our Python version to 7.2.10 as required in the Content Creation Tools TLSv1.2 Support Matrix of the "Insecure HTTPS and Old Toolkit Core Deprecation - January 23rd, 2019" (https://support.shotgunsoftware.com/hc/en-us/articles/360009371913). To do this, do we need to upgrade our Toolkit Core, or upgrade our Shotgun Python API or is there a way to upgrade our Python version straight ahead?